The Mt. Baker-Snoqualmie National Forest is hosting three Student Conservation Association (SCA) Fisheries Internships in Darrington, WA. Internship estimated start date is Monday, June 10th through Friday, Sept 27th. Application period will be open until positions are filled. Apply on the SCA website. For more information visit the SCA website or contact the Fisheries Program Manager Richard Vacirca at rvacirca@fs.fed.us or 425-783-6040. As a reminder, while it is not explicitly stated in the position description for the NPS Academy internship, our goal for this program is to engage students from underrepresented groups in a rewarding 13 week experience at Mount Rainier. The first week of this program will consist of an orientation and training that is centered on conversations around diversity, equity, and inclusion on our public lands. Then, the next 12 weeks will focus on in-depth skills training, mentorship, and the opportunity to work directly alongside National Park Service personnel. Ultimately, it is our goal to provide a truly inclusive experience for our interns that will encourage them to consider a career with the National Park Service or its sister land management agencies. With this in mind, we will also be providing training and guidance on applying for federal jobs, networking, and professional development. Summer internship opportunity at FISH! My name is Pepper Hambrick, Program Coordinator for Friends of the Issaquah Salmon Hatchery. Every year, we run a summer camp for ages 3-11 on the hatchery grounds which teaches children about their place in this environment while having fun. In the past, students from the surrounding area have found an enriching summer experience helping out as camp aid and general education assistant, and I would like to extent that opportunity once again. The position is unpaid but offers a wide variety of experiences for someone interested in either biology, environmental science, or early education. Or all three! Comments Off on Summer internship opportunity at FISH! Starting June 2019, the hydro-biogeochemistry group at the University of Washington in Seattle has an opening for a summer field technician. The technician will be working at two field sites located in Alaska — one in Fairbanks and one in Kenai — on a project investigating methane production and methane oxidation in permafrost thaw bogs. The project is focused on advancing understanding of how permafrost landscapes in Northern latitudes affect and are affected by climatic change. The site in Fairbanks is in the Bonanza Creek LTER research forest and is part of the Alaska Peatland Experiment (APEX). The site in Kenai is located in the Kenai National Wildlife Refuge. The technician will live in Fairbanks over the summer and will travel back and forth to the two field sites by car. This is a paid hourly position with shared housing in Fairbanks provided. The technician will assist the field efforts of a graduate student researcher working at the two sites; will be responsible for making various routine measurements (e.g., gas flux, well elevations, water levels, active layer depth), and overseeing performance and troubleshooting (if needed) of an automated belowground root imaging and oxygen sensor network; and will be expected to backpack heavy loads of equipment into the site (~1 mile distance). If you are interested, please contact Rebecca Neumann (rbneum) with: 1) a cover letter expressing why you are interested and qualified for the position, 2) a CV or resume, and 3) the names and contact information of three individuals able to provide a letter of recommendation. As expected, all of our Spring Programs are now closed. Our Summer programs continue to fill at a record rate, and we will be closing applications to Washington D.C., Miami, Chicago and San Francisco at midnight on Sunday the 17th of March. Any students who are interested in those cities should apply now to avoid disappointment. This year has been the first that we have offered our Student Aid scheme, which grants up to $3,263 to students enrolling in one of our programs. All students are eligible for some aid, with 100% of students so far receiving over $1000 towards a City Internships Program of their choice. We will continue to provide as much support as possible to Students, but we anticipate making changes in the beginning of April – this is something I will notify you of nearer to the time, but I would again encourage students who aim to rely on our Student Aid offering to apply sooner rather than later as this date may be moved forward. City Internships is a member of the National Association of Colleges & Employers (NACE), NAFSA: Association of International Educators, The Forum on Education Abroad and the National Society on Experiential Education (NSEE). 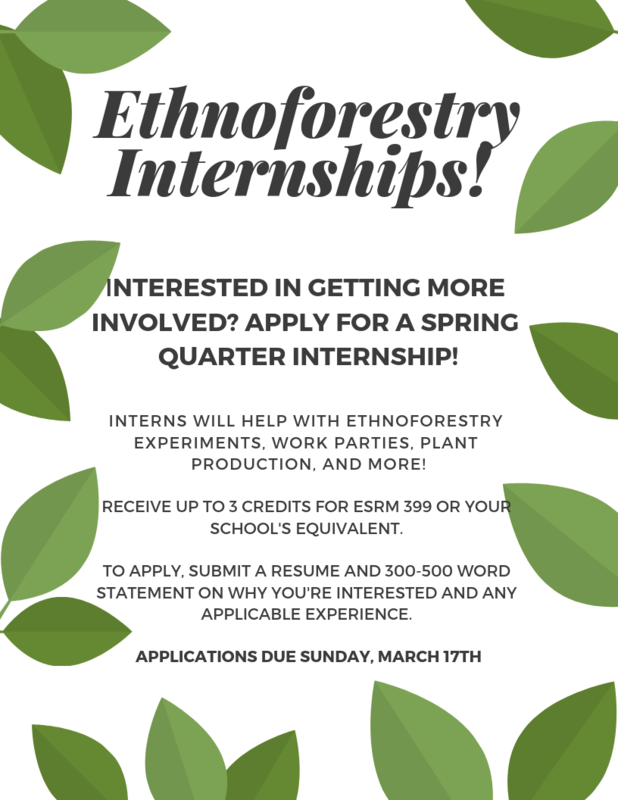 Ethnoforestry Internships!!! ESRM 399 Credit! 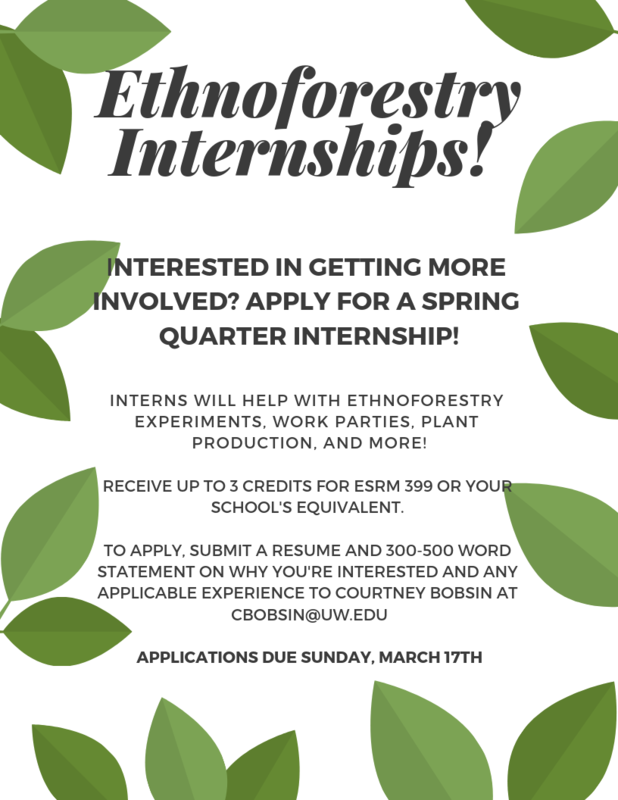 Comments Off on Ethnoforestry Internships!!! ESRM 399 Credit! We are seeking a part-time GIS intern for the spring quarter (exact dates are flexible). Under guidance and supervision of The Nature Conservancy’s Conservation Geographer in Washington, the intern will be responsible for supporting webmap development in two Puget Sound floodplain and agriculture resiliency projects and fulfilling particular mobile mapping needs of our Forest Managers. This internship requires skills with ArcGIS Spatial Analyst to process and prepare raster data for publishing online map services. Experience with geodatabase management (creating relates, domains, etc. ), Esri Collector app, and map service publishing are highly preferred. Attention to detail is a must! Our lab is commitment to diversity includes the recognition that our lab’s mission is best advanced by the contributions of people of diverse backgrounds, beliefs and culture. We seek to create an inclusive lab group, and we encourage applicants from all cultures, races, colors, religions, sexes, national or regional origins, ages, disability status, sexual orientation, gender identity, military, protected veteran status or other status protected by law.